To be fair I have found the actual school children singing their song as it was demonstrated by their teacher. Of course we added an ending we thought was appropriate. And now we also find out he has his own Tv channel too! You had better wake up if he can pull this off before he is even elected imagine what he will do with the power of the presidency! Wake up America! 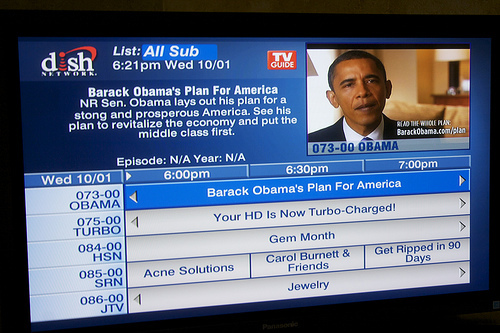 The channel’s appearance has provoked scorn and alarm on conservative blogs, though, and some discussion on a forum for Satellite TV aficionados, where one user writes that a Dish Network executive emailed to reassure the user that it “is paid advertising by the Obama campaign and is not an endorsement of Senator Obama by DISH Network” and will broadcast through November 4. A spokeswoman for EchoStar, the Dish Network’s parent company, didn’t respond immediately to phone and email inquiries abotut the channel. What ever happened to that “Equal Time” rule? If EchoStar makes available a full channel for the Democrats, then are they not suppose to make the same time available to the republicans? John, while you are technically correct, media has long abandoned that practice and it is not enforced. That ship sailed a long time ago and apparently all the complaints in the world have had no effect upon the perpetrators. They seem to know that nothing will be done about it. Way to go BettyJean! Keep the heat on how scary an Obama administration would be if Barack (or Barry) were selected to be POTUS 44. For those that forget history and refuse to learn from mistakes, everyone will be forced to repeat them. Sadly, the USA will be the evil oppressor and other countries will be obligated to stand up against the tyranny arising from an Obama administration. Wake up before it is too late and VOTE McCain in 2008 for POTUS. Did you read the story in American Spectator ? Seems like Obami took 200 million from foreign countries and won’t disclose exactly who. That could be a big one. Betty Jean you are remarkable! I don’t know how you do it. But you are right. This is scary stuff. My first thoughts when I heard about this were yours exactly. Being my age I do remember the Hitler youth etc and then we go onto the other dictactors around the world. Don’t these people stop and think about what they’re doing? Looking at their faces ..I just don’t know what to think. If we don’t stop this it will be too late and our beloved country will never be the same. Very well done, Betty Jean! Those videos are scary. I posted a simple analogy to explain how we got into the financial mess we’re in. There are some great videos, too. Oh my god what is wrong with people in this country voting for him, I don’t understand what are they thinking, this will be worse than Nazi germany, this is very scary everyone in this country should be outraged not for that fake crap Obama is shoving down their throatl God help us all. I feel compelled to say after reading about ACORN voter fraud identified in IN we should be afraid of Obama. I was a Dem. but they no longer represent me. It is a totally different party than in 2000. Especially since Thurs’s debate, Joe Biden has chosen to represent the ideas of Obama- the new & lousy Democratic Party, I am voting for McCain/Palin 08, in hopes that the Democratic Party returns to its former way of representing the people in 2012. Then we can vote for Hillary vs. Palin. Go Sarah & Sen. McCain.